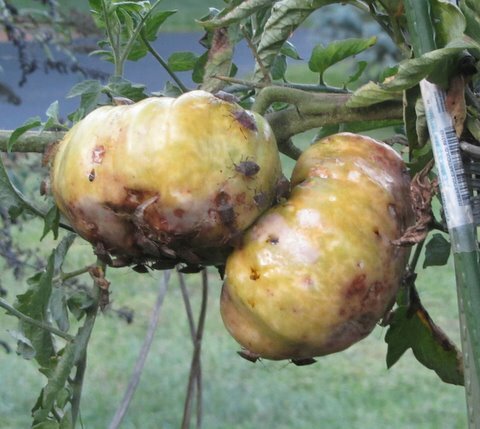 What have scientists learned during the last year in studies of the brown marmorated stink bug, the East Asian invader that is threatening many of our garden and field crops? Last week I found on the Internet two new research papers, “Summary of Brown Marmorated Stink Bug Infestations of Maryland Crops” and “2011 Insecticide Trails to Evaluate Control of Brown Marmorated Stink Bug,” by three University of Maryland researchers, Galen Dively, Cerruti Hooks, and Terry Patton. I’m going to tell you several of the research findings that I find fascinating, but I do not claim to be a scientist, so this posting is merely one gardener’s report about what he read in the two papers. I assume the two reports will be two of many building blocks on which experts will build future research projects and from which they will draft, hopefully, recommendations for both commercial food growers and backyard gardeners for the 2012 growing season. 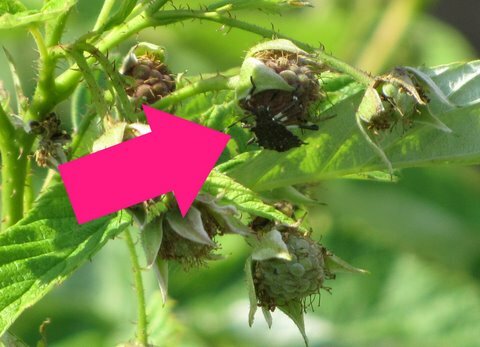 The first paper covers the impact of the brown marmorated stink bug (BMSB) on a variety of crops: small grains; field corn; soybeans; apples, grapes, and peaches; raspberries; pumpkins; tomatoes; peppers; summer squash; sweet corn; green beans; eggplant; okra; spring/fall cabbage, spring/fall broccoli, kale, bok choi, onion, beets, cantaloupe, cucumber, watermelon, sweet potato, and white potato. Since most readers of this blog are backyard gardeners, I’ll focus on typical garden vegetables. The second paper covers the effect of various insecticides on BMSBs. Number of stink bugs: Numbers were significantly less than in 2010 at the western Maryland site but 2.5 to 3 times more at other locations. Comment: This confirms anecdotal reports from other gardeners, that there seemed to be “fewer stink bugs overall” in 2011, but perhaps just as many or more in our gardens. Peak population: “Peak captures at Beltsville and Upper Marlboro exceeded 400 per night during the 3rd week of July,” but peaks on some crops came in August. Comment: Early July was when I surrendered and began using a pyrethroid spray in our vegetable and fruit gardens. 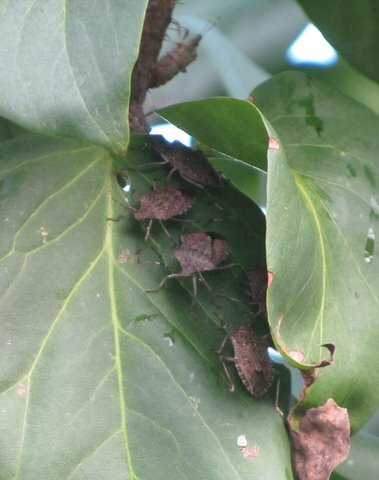 Host plants: “Clearly, this introduced tree [Paulownia], along with the Tree of Heaven, is a major reproductive host….” Comment: Brown marmorated stink bugs are natives of China and other East Asia countries, as are Paulownia and Tree of Heaven. Stink bugs probably are attracted by plants from “back home,” so to speak. I suppose I shouldn’t have been surprised to see hundreds of stink bugs on our lilacs, another East Asia native. Proximity to woods and buildings: Scattered through the papers are indications that stink bug numbers are higher on crops near woods or buildings and on crops at the edges of fields. Comment: Backyard gardeners may have the worst exposure to stink bug damage because gardens often are close to buildings, trees, and shrubs. Also, gardens often are not large enough to have “edges” and “centers” sufficiently distant to affect the level of stink bug damage. Peppers: Tests include a variety of peppers, including bell, banana, and hot jalapenos. Depending on variety, damage ranged up to 86% of the crop. “Two hot types … were less susceptible to fruit injury, and, unexpectedly, a black bell variety … showed no evidence over the entire crop cycle.” Comment: The paper names all varieties tested. Summer squash: “If more attractive crops are available, squash will likely not be a preferred host plant.” Comment: Stink bugs destroyed all young fruit of my zucchini plants. Here’s a typical conclusion from the second paper’s bell pepper section on the effectiveness of several insecticides on stink bugs: “All 12 insecticide treatments provided significant reductions (61-96%) of stink bug numbers,” though only some insecticides reduced the level of fruit injury significantly. There were some suggestions of “the possibility that some adults may have recovered after certain treatments.” Comment: Though insecticides are named in the paper, they should not be used until they have been approved by appropriate government review agencies. I’m happy to read that researchers are making progress in their stink-bug studies, and I look forward to future application of research findings from these researchers and others that will benefit those of us who grow crops, whether by hundreds of acres or in our backyard gardens. If you want to review the research papers, CLICK HERE. The two papers appear together at that link. The first paper includes photos of damaged vegetables. The second includes charts detailing effectiveness of insecticides used in the studies. Thanks very much for summarizing the current research, Bob! It suggests that use of Pyganic and Surround are the best available organic alternatives.